OVER THE RIVER AND THROUGH ... – Jenny Valley of Barrie, Ont., leads a pack over the Millennium Bridge shortly after the beginning of the half-marathon event Sunday morning. 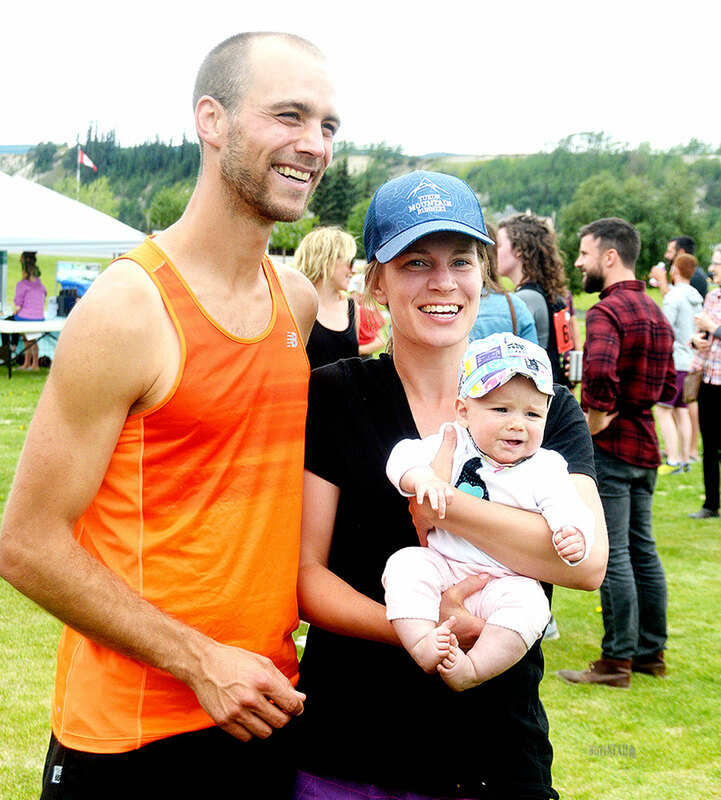 HAPPY ENDING – David and Jody Eikelboom of Whitehorse were all smiles with their baby Aleida after winning the re- lay event in this year’s annual Yukon River Trail Marathon. The Carcross resident covered the 42.2 kilometres in a time of three hours, 24 minutes and 52 seconds, averaging 12.36 kilometres per hour. McHale crossed the line two minutes ahead of Brendan Morphet, the top male marathoner. 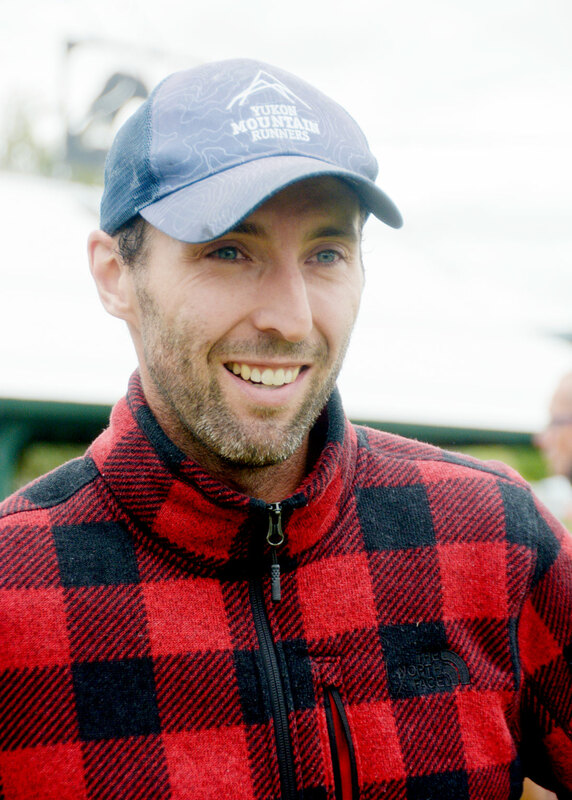 But McHale was quick to point out the two bears Morphet encountered while he was the lead runner most likely played a factor in her first-place finish. It did force him to turn around and as a result he probably ran four or five kilometres more than she did, she said. Nonetheless, McHale said she felt good out on the trail, despite what she described as the heat, even on a mostly overcast morning. Some 300-plus runners ran either the marathon, half-marathon, or the full-marathon relay involving teams of anywhere from two to four runners. Five walkers completed the half-marathon. 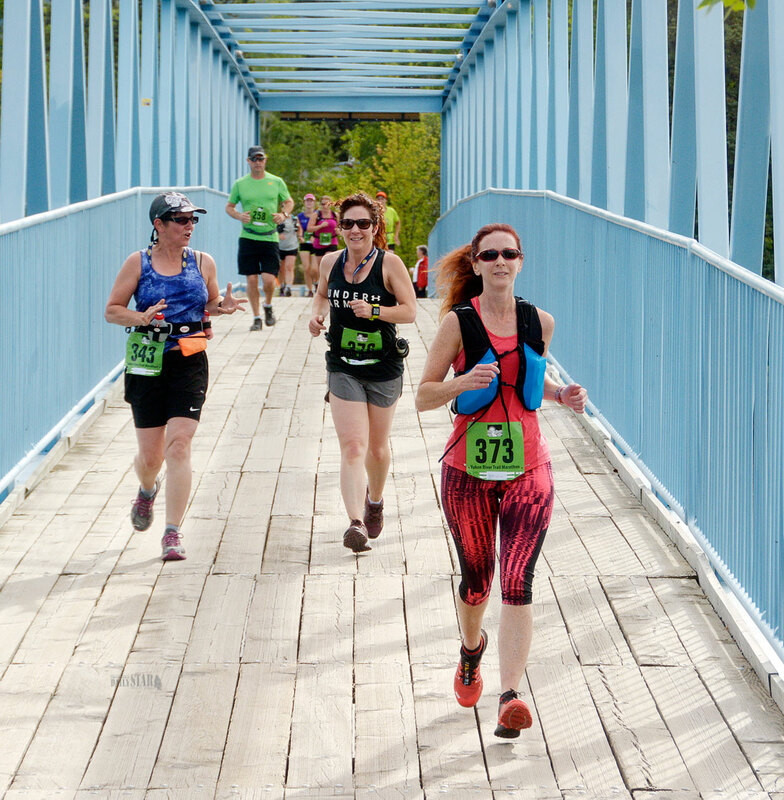 The race was dedicated to the late Ric Janowicz who died suddenly this past spring at the age of 65 while on a cycling tour in the U.S. Each medal presented to those who crossed the finish line noted this year’s dedication to Janowicz, founder of the Yukon River Trail Marathon. After cooling down and catching his breath, Morphet explained how he was running good and had a comfortable lead when he turned a corner and saw two bears, presumably grizzlies judging by their humps. He did the normal response of yelling and trying to frighten off the bears, as he retreated back around the corner. It’s not the first time Morphet has encountered bears while trail running. The bears did not respond. When he peaked back around the corner, they were coming toward him, and he decided running back down the trail to leave the area to warn and join the company of other runners behind him was the best choice at that point. “They looked like grizzlies, but I did not want to get too close to check it out,” he said. Morphet said the encounter destroyed his pace, and his race, adding that he had a tough time on the trail afterwards, having run out of water, food, and even falling a couple of times. He estimates he ran between five and seven extra kilometres. McHale had to give him water when she passed him, he pointed out. There were no other reports of runners encountering the two grizzlies although another runner did see a black bear elsewhere on the trail. David and Jody Eikelboom won the relay marathon in a time of 3:06:31, with David running the first and fourth legs and Jody the second and third. Lindsay Carson of Burnaby, B.C., posted the fastest time in the 21-kilometre, half-marathon, finishing in 1:36:57. Whitehorse resident Jane Haydock was the fastest walker in the half-marathon, finishing in 3:16:28. In the women’s marathon, it was McHale running in the masters, 40- to 49-year-old class in the time of 3:24:52. In second was Virginie Besset of Whitehorse in the open, 14- to 39-year-old class, in a time of 5:07:25, followed by open runner Maren Bradley of Whitehorse in a time of 5:21:27. In the men’s marathon, it was Morphet (14-39) in the time of 3:26:51. Juneau runner John Nagel (50-59) was second in a time of 3:43:02 while Argue Mike (14-39) of Yellowknife was third in a time of 4:05:43. In the women’s half-marathon, it was Carson (14-39) in the time of 1:36:37. In second was Whitehorse runner Amy Kenny (14-39) in 1:53:59 followed in third by Sandra MacDougall (50-59) of Whitehorse in a time of 2:00:44. In the men’s half-marathon, Whitehorse runner Jonathan Hawkins (14-39) set the pace with a time of 1:38:33. Magnus Kaltenborn (14-39) of Whitehorse was second with a time of 1:43:52 and Carcross runner Arno Barre (14-39) was third in 1:45:58. The women’s relay event was won by the Chilkoot Cheetahs, a four-member team of Whitehorse runners who completed the 42.2 kilometres in a time of 4:22:15, or an hour and 16 minutes behind the overall first-place Eikelbooms. The team was made up of Cascia Krolczyk, Kylie Bird, Christie Harper and Katie Moen. The men’s relay event was won by Maximum Capacity, a four-member team of local runners who finished in 3:46:04. The team was made up of Ryley Johnson, Jason Biensch, Micah McKleag and Spencer Edelman. The five walkers to complete the 21 kilometres were Haydock (50-59) in the winning time of 3:16:28; Joseph Cinq-Mars (14-39) of Cold Lake, Alta., in a time of 3:38:49; Kamloops, B.C., walker Bruce McNeely (60-plus) in a time of 4:31:46; Shari Heal (40-49) of Whitehorse in a time of 4:48:41 and Brianna Heal (14-39) of Whitehorse in a time of 4:48:43.